Founded in January 2016, Clinical Trials in Degenerative Diseases (CTDD; ISSN: Print -2542-3975, Online -2542-3983) is a peer-reviewed, open-access international journal (http://www.clinicalto.com/) with quarterly print on demand compilation of issues published, with its mission focused on reporting creative clinical and translational advancements on the subject of degenerative diseases. The editorial board comprises over 100 members who are dedicated to developing a journal presenting outstanding peer-reviewed, evidence-based scholarly research in degenerative diseases. Recruitment of new editorial board members is ongoing. Revised manuscript (traced copy): Include a traced copy of your manuscript file showing the changes you have made on the original submission. The first author or the corresponding author should provide ORCID upon manuscript submission. CTDD also helps authors to register a unique ORCID identifier to uniquely identify author’s publication. Invited Reviews: Invited reviews are topical reviews, generally 6,000 words in length, which cover a current topic of interest in degenerative diseases. Invited perspectives: Authors with outstanding achievements in the field from international renowned laboratories are invited to write a short paper that has not been previously published, introducing their scientific hypothesis, specific animal models or patients as participants, a novel technique or method, materials, or cell type. The invited perspectives should introduce compelling new stories about how scientists or laboratories yield their striking thoughts or achievements, rather than simply describe their research progress. These papers will provide readers with novel thoughts and insights. Templates of Study Protocol, Invited Reviews, Invited Perspectives, Research Articles, Hypotheses and Methodology are shown in Additional files 1–5. CONSORT Statement For reporting of randomized controlled trials, please use the appropriate extension to the CONSORT statement, including the extension for writing abstracts. 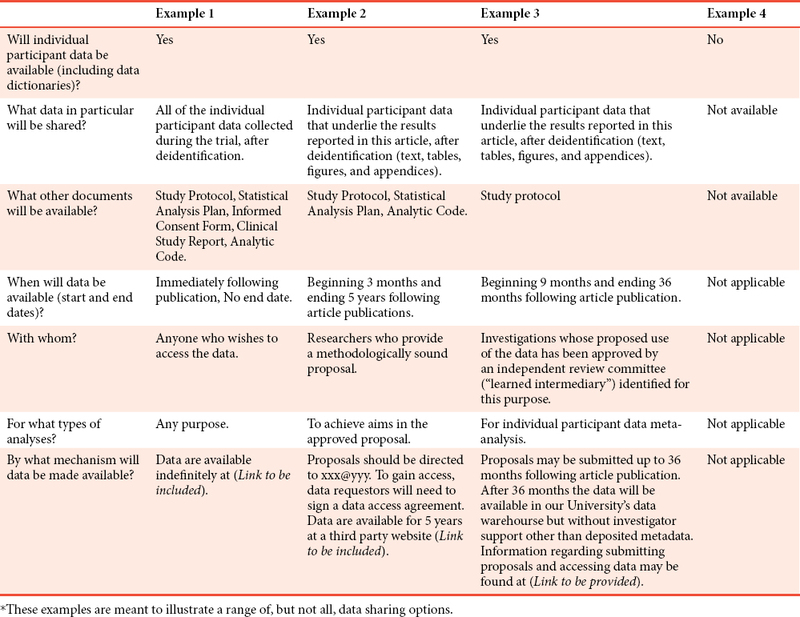 As of 1 January 2018, manuscripts submitted to CTDD that report the results of clinical trials must contain a data-sharing statement as described in [Table 1]. We would like to bring this to your attention and the editorial office can decide whether to add any policy statement on Author Instruction page (http://www.icmje.org/news-and-editorials/data_sharing_june_2017.pdf). CTDD is co-published by Wolters Kluwer-MedKnow, a global open access medical publisher. Therefore, CTDD applies the Creative Commons Attribution-NonCommercial-ShareAlike 3.0 License to works we publish. This license allows others to remix, tweak, and build upon the work non-commercially, as long as the author is credited and the new creations are licensed under identical terms.